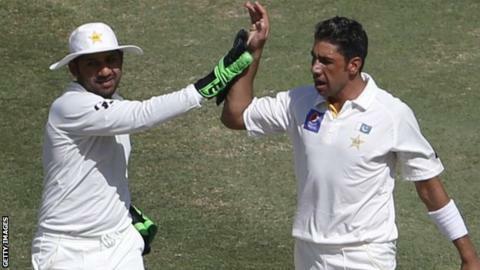 Pakistan saw off Australia's remaining batsmen to earn a crushing 221-run win in the first Test in Dubai. The Aussies began the final day on 59-4, facing a Test record victory target of 438, but more realistically aiming to bat through the day for a draw. Opener Chris Rogers, often Australia's top-order anchor, was bowled by debutant paceman Imran Khan for 43. Steve Smith (55) and Mitchell Johnson (61) resisted for a while before Pakistan's spinners wrapped up victory. Left-arm spinner Zulfiqar Babar (5-74), who had to contend with dropped catches and a missed stumping off his bowling as Australia tried to delay the inevitable, returned the best figures of his three-Test career. He bowled well in tandem with leg-spinner Yasir Shah who took 4-50 on his debut. Peter Siddle was the last wicket to fall, given out caught by Azhar Ali at silly point off Babar after the tail-ender's umpire review was turned down with 21.5 possible overs left in the final session. Indeed, 15 of the 20 Australian wickets in the match fell to spin, while the tourists were indebted to Rogers, his opening partner David Warner, Smith and Johnson - the only players to reach double figures in each innings - to save them from an even heavier defeat. Younus Khan, who hit a century in each innings to set a new Pakistan record, was named as man of the match. Meanwhile, Australia may be concerned by the form and fitness of Michael Clarke, who was playing only his second international match since March because of injuries, including a hamstring problem which ruled him out of the preceding one-day internationals. Clarke could only manage five runs in two innings in Dubai, and his side face a busy programme over the next few months. The second and final Test of the series begins in Abu Dhabi on Thursday, and Australia then travel straight home for a limited-overs series against South Africa in November and four Tests against India in December and January. They then host a triangular ODI series against England and India before co-hosting the World Cup, which begins on 14 February, with New Zealand.